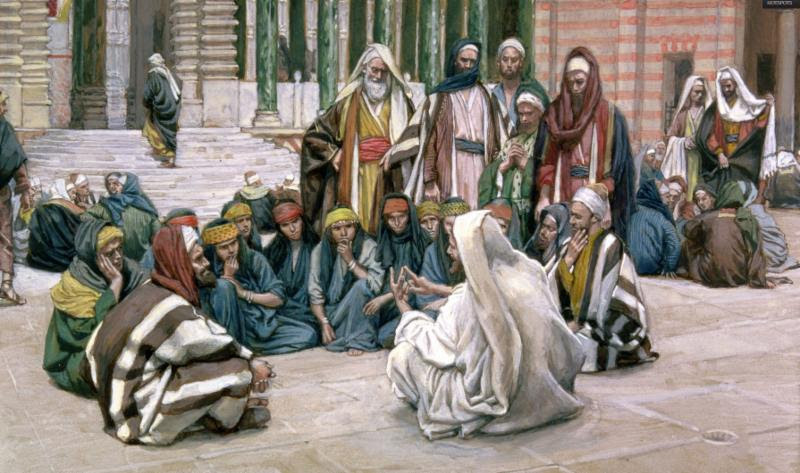 The Gospel of Matthew was written to a primarily Jewish audience and sought to 'connect the dots' between the old law, which was so familiar to the Jewish converts, and the new law as brought to completion in Jesus. Today's passage (Matthew 5:17-37), is our third installment of the Sermon on the Mount and is all about the law as Jesus raised the law of Moses to a higher and deeper level. Jesus said to his disciples: "Do not think that I have come to abolish the law or the prophets. I have come not to abolish but to fulfill. Amen, I say to you, until heaven and earth pass away, not the smallest letter or the smallest part of a letter will pass from the law, until all things have taken place. Therefore, whoever breaks one of the least of these commandments and teaches others to do so will be called least in the kingdom of heaven. But whoever obeys and teaches these commandments will be called greatest in the kingdom of heaven. I tell you, unless your righteousness surpasses that of the scribes and Pharisees, you will not enter the kingdom of heaven. "You have heard that it was said to your ancestors, You shall not kill; and whoever kills will be liable to judgment. But I say to you, whoever is angry with his brother will be liable to judgment; and whoever says to his brother, 'Raqa,' will be answerable to the Sanhedrin; and whoever says, 'You fool,' will be liable to fiery Gehenna. Therefore, if you bring your gift to the altar, and there recall that your brother has anything against you, leave your gift there at the altar, go first and be reconciled with your brother, and then come and offer your gift. Settle with your opponent quickly while on the way to court. Otherwise your opponent will hand you over to the judge, and the judge will hand you over to the guard, and you will be thrown into prison. Amen, I say to you, you will not be released until you have paid the last penny. "You have heard that it was said, You shall not commit adultery. But I say to you, everyone who looks at a woman with lust has already committed adultery with her in his heart. If your right eye causes you to sin, tear it out and throw it away. It is better for you to lose one of your members than to have your whole body thrown into Gehenna. And if your right hand causes you to sin, cut it off and throw it away. It is better for you to lose one of your members than to have your whole body go into Gehenna. "It was also said, Whoever divorces his wife must give her a bill of divorce. But I say to you, whoever divorces his wife - unless the marriage is unlawful -causes her to commit adultery, and whoever marries a divorced woman commits adultery. "Again you have heard that it was said to your ancestors, Do not take a false oath, but make good to the Lord all that you vow. But I say to you, do not swear at all; not by heaven, for it is God's throne; nor by the earth, for it is his footstool; nor by Jerusalem, for it is the city of the great King. Do not swear by your head, for you cannot make a single hair white or black. Let your 'Yes' mean 'Yes,' and your 'No' mean 'No.' Anything more is from the evil one." Our first reading from the Book of Sirach (15:15-20) teaches us that God always gives us free will - a choice between life and death, good and evil and that we must live with the consequences of those choices. If you choose you can keep the commandments, they will save you; if you trust in God, you too shall live; he has set before you fire and water to whichever you choose, stretch forth your hand. Before man are life and death, good and evil, whichever he chooses shall be given him. Immense is the wisdom of the Lord; he is mighty in power, and all-seeing. The eyes of God are on those who fear him; he understands man's very deed. No one does he command to act unjustly, to none does he give license to sin. In our Epistle reading (1 Corinthians 2:6-10), St. Paul taught his followers that God's wisdom far surpassed anything their current culture could understand and yet it was revealed to "those who love him", through the Spirit..
Brothers and sisters: We speak a wisdom to those who are mature, not a wisdom of this age, nor of the rulers of this age who are passing away. Rather, we speak God's wisdom, mysterious, hidden, which God predetermined before the ages for our glory, and which none of the rulers of this age knew; for, if they had known it, they would not have crucified the Lord of glory. But as it is written: What eye has not seen, and ear has not heard, and what has not entered the human heart, what God has prepared for those who love him, this God has revealed to us through the Spirit. For the Spirit scrutinizes everything, even the depths of God. The law of God is written on our hearts. It is our choice to follow it, or not. Actions have consequences. The act of loving God, others and ourselves results in life with God.